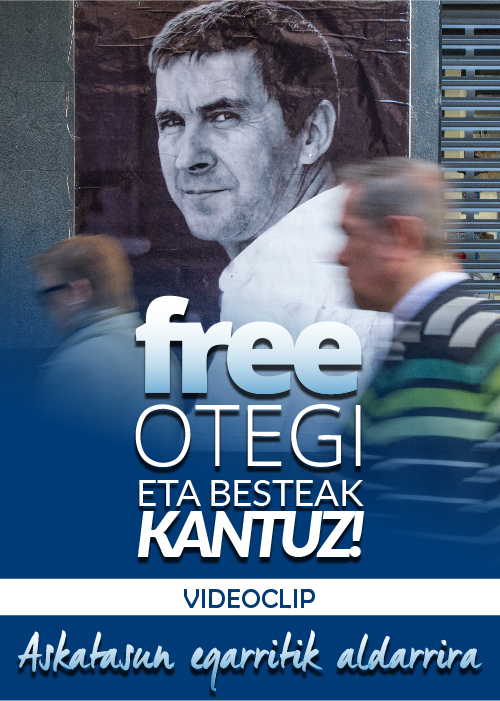 Arnaldo Otegi (Elgoibar, 1956) has answered from the cell the long questionnaire from Berria. He is in prison for five years now, condemned in the Bateragune case. He is one of the main agents of that ETA has left behind the historical armed cycle. He follows the political situation closely (but from the inside). He considers that the Basque Country must “prioritize” independence, inscribing in that the agenda of the consequences of the conflict. The interview was done by Iñaki Petxarroman. Q. ETA has announced that it has destroyed its armed and logistical structures. What importance does this decision have? The decision is, in itself, seems to me the logical and coherent consequence of the step taken in its moment the definitive finalization of the armed struggle. That means, that once the decision was taken, the destruction of all the structures of ETA and disarming are the only possible scenarios. In the political sphere, in change, the importance of the decision is great, because, in the end, it is inscribed in the logic of unilateralism and, therefore, the step is taken with the view put on the necessities of the process, and in no way to the states. Q. The Spanish Government has responded as always, saying that the only thing that ETA must do is disband itself. We have to examine rigorously what are the interests of the state in this historical moment. One thing is what they say and another, certainly, is what interests them. Often, what is said in ordinary public politics is nothing more than a mask of what they really want. For example, don’t they say every day that the Abertzale left must commit to democratic ways? And, when we did it they arrested us and imprisoned us… And the same can be said about the petitions for disarming that they do to ETA, since that, when the international observers took the first step, they brought them to the Spanish National Court. Q. ETA must continue disarming? With the end of taking decisive steps in the process of liberation that this country has in its hands, one has to respond rigorously to the following questions: Is the state interested in the disbanding and disarming of ETA? And our country? And, although theses are questions that must be planted in the sphere of the consequences, in that of the political conflict the time has also come to respond to these kinds of questions: Is it possible to achieve with this state a democratic agreement that contains national recognition and the right to decide for the Basque Country? We only advance if we answer these questions with rigour and correctness. Q. Urkullu refused to meet with the mediators McGuinness and Powell in their last visit to Bilbao. What do you think about it? these international observers (for the delight of the PP) and, in change, the it shows to talk and reach all kinds of agreements contrary to peace in this country. Q. Although ETA and the Abertzale left have taken steps, there exists the impression that the process is at a standstill. Do you think it has a future? This process I wouldn’t define as a peace process, given that these must fulfil a condition: the commitment and will for an agreement from all parts. Here, only the independentists have shown this commitment, in word and deed, therefore this is a process of liberation for whose development the Abertzale Left has renounced understanding the use of armed violence and in which ETA has declared the end of the armed struggle. The state, however, hasn’t made nor will it make that commitment, because the violence is necessary for them to deny the voice and decision to this country. Q. Why do you think that the states have taken the decision to close all the doors for an exit? Our change in strategy and the crisis of civilizations that has occurred at a worldwide scale have opened cracks in the foundations of the Spanish state – beginning with the crisis of the monarchy and ending in the economic or territorial spheres -. This situation has left the state without room to move. In the time of the transition, they had the offer of autonomy and this was the bait to confront independentism. This phase has finished, we have exhausted it. Q. What is the current situation then? You have to add to all of this another strategic and important factor: in Europe (Scotland, Flanders…) and in the Spanish state (Catalonia or in the Basque Country) it is ever more evident the capacity of independentism to bring together wide social majorities. For that, they have turned on all the alarms in the state, and their only objective is to gain time, practising stagnation for that – and I have the suspicion that this isn’t the only thing that this is doing – . In the case of the Basque Country, they are using the question of the consequences of the conflict to gain time, with only one objective: that another process such as Catalonia isn’t begun. Q. In a public act, the Abertzale Left recognized having acted with “coldness” to the victims of ETA. However, many are demanding more, denouncing that this is a tactical decision and not ethical. What would you say to them? Seeing these types of criticisms or many of the reflections made from a perspective of great blockage, I often feel myself at the point of deception. For example, it seems terrible to me to hear that things have to move before December because, if not, in a time of elections, things will be more difficult – I’m sure Paul Rios feels the same (from here all my support and encouragement!) -. When I hear things like that I often think: is this the level that the political class, the media, etc., have here in this country? So quickly have we forgotten the situation that we had hardly seven years ago? And the wounds and the suffering that are still to be closed? Q. But, the Abertzale Left must go further? Look, the work to change the strategy of the Abertzale Left was too terrible and hard, it implicated too much tension, to go lightly now about certain things. We speak of a revolutionary ethic, because there is not just one ethic, in the same way that there doesn’t exist just one story. Therefore, whoever says that we make the decision without considering ethical factors isn’t telling the truth. But it’s clear that our ethical principles aren’t those of the bourgeoisie ethics (and whoever wants to know what is the bourgeoisie ethic look at what the PP has done with the abortion law, that is, changing for some miserable votes what was a sacred principle). Q. What are those ethical principles? Once I read Fidel Castro that every revolutionary that fights for another society, if they can, should opt for the way that generates the least amount of suffering. The Abertzale Left has to think about that. But, with that said, and to put things in their place, I would add that we aren’t the only ones. The states have a tremendous historical responsibility. We, apart from recognizing before our people our responsibilities, we’ve paid dearly for them, and we will continue paying. However, this doesn’t worry me; in fact, it give me joy, because we demonstrate that in this we are also distinct. Q. The prisoners asked to be transferred to the Basque Country, but they haven’t received an affirmative response. Why? The reason is simple: Basque independentism, while it deals with the consequences of the conflict, won’t put in march the independence project and, therefore, it won’t open a second front in the state, together with that of Catalonia. Q. The French government has brought some prisoners closer. Could there be some kind of disagreement on this subject between Paris and Madrid? We can’t forget the paths that both governments have gone on together against our country during these long decades. However, I am sure that the social and political dynamics that they have developed in the North of the Basque Country will open cracks in the internal cohesion of the French government. We have to deepen this path. Q. The prisoners have recognised the damage caused. Instead of appreciating it the parties and the Basque government have asked them to recognise that this damage has been “unjust”. What do you think? To me, at least, the direct victims have never planted anything similar to me. Therefore, the new demands, which continuously change, lack all ethical objectives, so this is political. Here, what the PNV wants is very specific: that the Abertzale Left recognise that in 1977, they made a completely erroneous diagnosis of the of the political transition and that, what’s more, they do it publicly. Q. And what was the diagnosis? Well, it would be impossible for this country to obtain their rights in the political-juridical framework derived from the reform of Francoism. 35 years have passed, and to know who was right – what’s more, completely – in their diagnosis it’s enough to look at Catalonia, or listen to the latest declarations of Mr. Erkoreka [spokesperson of the Basque government], in which he compares the current situation with Francoism. Another question is the debate about the specific strategies put in march parting from this diagnosis. Yes I admit that this is all arguable, also from the perspective of the revolutionary ethical principles. And I am clear that we have something about which to reflect. Q. Spain has released some 60 prisoners for the decision of the Strasbourg Tribunal. Can we expect more massive releases that are similar? We had a tremendous joy, also in the political terrain, because it demonstrated that, even fighting in the sphere of their legality, sometimes you obtain great victories. I’m sure that the change in strategy had a great influence in this sentence. Q. Do you perceive enough force in society to achieve that the situation of the prisoners moves? I’d like to answer from the perspective of our ethical commitment: we are political activists, volunteers, we are Basque citizens who struggle for free for our country, with all of our virtues and all of our errors. Therefore, we aren’t the ones to judge our people; more than that, our people are our judges. We Basque political prisoners receive a lot of support and love from our people, but, at the same time, the prisoners and activists of the Abertzale left owe it to them, I’ll admit that, in case, we haven’t known how to comply with the necessary quickness and intelligence that our people put to us a long time ago. This will also have to serve us for self-criticism, because we also owe this to our people. Q. More than once they have denied you and the rest of those sentenced in the Bateragune case to leave prison. You will have to serve the entire sentence. Why? From the beginning, we had it pretty clear that we would complete the whole sentence. I remember when they brought me to the register of the house in San Sebastian and, passing for the tollbooth of Zarautz, I thought that I would spend many years before I could pass by there again. It seems to us that the reason for why we have to complete the entire sentence is that the message that the Spanish government transmitted to their chancelleries around the world six or seven years ago was that they were destroying ETA and driving the Abertzale left to political marginalisation. We our change in strategy we turned the tables in this context and brought the confrontation to the political terrain ruining the objectives of the state. They don’t forgive us for that and that is why we are prisoners. Things being this way, I’ll take advantage to again reaffirm that, on this path to peace, the work of Sonia [Jacinto], Arkaitz [Rodriguez], and of Miren [Zabaleta], etc. [all of them condemned in the Bateragune case], as well as that of Jesus Egiguren [former president of the PSE-EE] and Paco Egea, was much more important than mine. Q. In your case, they have stripped you of the opportunity to work in politics. Will the Tribunal in Strasbourg at least correct that? I don’t doubt that, in the legal sphere, Strasbourg will admit we are right. In the political terrain, in change, when it comes out, it won’t be the Spanish government nor the courts who decide where I’ll be, but our activists. Q. Everyday you receive messages of solidarity from around the world. Do you think the world has some indication of the injustice committed with those sentenced in the Bateragune case? In our case – as well as in many others – , our commitment has meant for us to have some close relations in the international sphere. Now we are taking advantage of this and what happened in the Bateragune case to put in evidence the true anti-democratic nature of the state and the general problem of the prisoners. This work has had results and I think it will still have even more. Q. The Abertzale left after internal reflection and debate, how do you see currently, the Abertzale left? The analysis made during this final and long decades has brought me to the conclusion that the abertzale left disposes of an enormous capacity to create new scenarios and spread great hope among our people. But, later, it has some terrible problems to adapt to the new scenario and act in coherence with it. Q. Could you summarise that? impossible, at least if we want to obtain the corresponding political benefit of the new strategy and the new scenario. If, at the time, the change in strategy implied a first revolution, now we have to face the second, which will imply the change of our political culture: only in that way will we achieve creating a renewed independence project and form in the Basque Country a solid social majority favourable to it. I know that Sortu is thinking about it, and I am sure they will get it right. Q. The abertzale left has decided to advance unilaterally. Does this clash with the bloody-mindedness of France and Spain? The motor of the process is a democratic clash. Or does anyone believe that we can achieve our objectives without clashes or struggles? And, that said, I’ll go further: our historical strategy had as its objective negotiation and agreement with the state in a democratic framework which includes our national and democratic rights. But perhaps the moment has come to think that we have to carry out the liberation process, integrally, until the end, without any agreement with the state. Q. Does there not exist any space for agreement? Catalonia shows us. And, analysing the current and historical – at least that if a revolution at a state level -, all of those who suggest a third way is doing nothing but blowing smoke. This passed to Unió [of Catalonia] and to those who speak of shared sovereignty. Or maybe someone believes that the governments of the PP and the PSOE are willing to share sovereignty that is just the Spanish people? We are realists: here, the only alternative is independence. Q. The abertzale left finds itself submerged in institutional work, in all of the institutions. Do you see any risk of wearing out your activist capital and anxiety for change in society? Once I read in Lenin that “doing politics is like walking on the edge of a precipice”. Therefore, for those of us who want to change the world, our political activity is full of risks, against which I think there exist two powerful antidotes. On the one hand, to have it very clear that, with institutional work being very important and necessary, we won’t obtain our national and social objectives only with the work that we do in this area. And, on the other hand, that, to take the risk of being assimilated by daily politics, it becomes totally necessary to create and build citizen counter-powers (in trade unionism, ecology, feminism, culture…). These counter-powers need total autonomy and an unlimited space for criticism, because only in that way will they be effective. We these two antidotes we assure ourselves that the work that we do in the institutions and the popular struggles go forward, that is to say, in the direction of building a free, cultured and socially advanced society. Q. What opinion do you have of the work that EH Bildu – including Sortu – is doing in the institutions? citizens’ participation? There we are gambling our credit those of us who want to be a transforming alternative. There is the key. Q. In these three years what has the Abertzale left gotten right? Where has it failed? Although we still have a long way to go, I would say that we have totally gotten right the change in strategy and in the conclusion of wide popular alliances (EH Bildu). The failures are those already mentioned, that’s to say, to continue responding to the new strategy with political forms and schemes of the past, because that limits our potential a lot. Q. What are, in your judgement, the main challenges of the Abertzale left in the political time that is coming? Again I mention that I am not on the street and, therefore, not in the leadership. For that, mine are only contributions and they must be understood as such. So, in the first place, I would say that we still haven’t perceived the dimension of the historical phase in which we live in. On the one hand, that the capitalist crisis isn’t an ordinary cyclical crisis and that it implies an economic and political clash that has the entire world as its scenario, among other reasons because it implies the fall of what till know has been the hegemonic power – the United States – and the prolonged birth of new powers that are reanimating – China, above all – . If we perceive that, we will better understand what is happening in the Ukraine or Syria, or the decision of Japan to rearm. Q. And in the Basque Country? The other point is the structural crisis of the Spanish state, which is in the thrashing of all the foundations built in the transition. In this context, I have it clear that the liberation project that surged from the people has exhausted a phase. Therefore, we must return this project to the people and, with it, dream, debate and build and independence and socialist project that responds to the context of the dawning of this XXI century. For that, the debate, as it is strategical, must leave the closed structures and be done in the towns and with the people, because now, more than cohesion, we need hope and passion for the struggle. Q. Can you specify your proposal more? At the time of beginning our journey, I took the lesson of the creation process of Herri Batasuna – when it was organized town by town, when it defended the philosophy of that the best mayor is the people, when it opted for popular unity… – . Awhile ago I read that Hasier Arraiz, in this moment, the truly important thing is to organize well a Broad Front beyond Sortu. I agree. And this Broad Front can’t lose its plurality, its different internal cultures and, above all, the model of democratic functioning in which the decisions are taken by all of the activists. Only in that way will we be able to build the Broad Front in a stable and effective way. If someone would ask me what was the objective that we pursued with the change of strategy, I would answer that in the national sphere, to realise a process such as that in Catalonia and, in the political-ideological terrain or in the organizational model, that which Herri Batasuna put in march in 1978. Q. The PNV used to impute as a responsibility of the Abertzale left that it leaves the political-military cycle without any compensation for having missed trains. Is that criticism worthy of being taken into consideration? what the PNV wants to obtain saying things like that. Create tensions between us? Or we, following the dynamics of the past, criticise harshly the position of the PNV in these processes? I say it again, it is the time to look forwards, not backwards. In this sense, the letter published by Ibarretxe and Iñigo Iruin [in which they asked for the release of those sentenced for the Bateragune case], apart from being plausible, it was exemplary. That is the way. Q. What do you think about the sentences from the Spanish National Court about the Herriko Tabernas [popular meeting spaces of the Abertzale left] or the 40 youths of Segi? The absolution of the youths made us very happy; the sentence of the Herriko Tabernas, instead, worried us. And we look with the same worry about the coming trials. However, we don’t need to make great political analyses about these sentences. In the end, we mustn’t forget that the Spanish National Court, the Supreme Court and the Constitutional Court are political instruments that act under the control of the government and that this employs them to detain the process. Q. In various European countries, the sovereigntist processes are blooming with force; Catalonia, Scotland… What opinion do you have about the situation we are living in? More than five years ago, when we wrote the Argitzen paper we said that “currently, new states can be created, also in the European Union, always when wide social majorities are created for that”. Recently, Scotland has demonstrated it -and although the No vote won, I’m sure that sooner or later we will see Scottish independence -. Also in the Spanish state, with its great peculiarities, the Catalan independence process is on the march. In the Basque Country I see that the basic tasks for a process like that are rather behind schedule, among other reasons because they still haven’t put in march a popular debate to outline and build a project of independence and of the left for the XXI century. Q. Following closely the situation in Catalonia. Will the Catalan independentists achieve their objective: creating a sovereign state? Compared to us, Catalonia has already had the aforementioned debate. They also have a precise roadmap, even the White Book for independence. And if that wasn’t enough, they have put in march thousands of volunteers to go house to house to convince the people of the necessity of independence. This process will have difficulties, terrible obstacles, but, in my judgement, it’s irreversible. And it is because the process, in its origin and development, has come from the people. This should give us the opportunity to learn. Q. How could this influence the Basque Country? It is already having an influence, among other reasons, because those who come to you or me plant us the same question: why isn’t there in the Basque Country the same independence process in march as in Catalonia? I’m sure that every time wider sectors are asking that question. Q. In the Basque Country are they taking advantage as they should of the political opportunities that can come out of this context? I repeat that I am not on the street or in the leadership… and therefore, I will respond with complete sincerity what I see from my cell: in my judgement, no. Q. Gure Esku Dago is uniting abertzales of different tendencies and many agents in favour of the right to decide. After the demonstration of force on June 8th, are you optimistic about what it can contribute? The first step has been spectacular. Now they are announcing others and, in my opinion, the moment is coming to accompany these mobilizations with specific proposals. That said, and although it can seem somewhat bold, if I had to say something to the people implicated in this movement it would be that they don’t allow anyone get into the agenda of what is only of the people; that it be the people, and, in no way, of the parties. Q. Can the Basque Country begin the journey of sovereignty without untying the knot of the conflict? Or do you consider that the first thing is to overcome the consequences of the conflict? When, at the time, we planted the change, we divided, in a very mechanical way, the process into two spheres: first overcoming the consequences and, later, resolving the political conflict. Seen with the perspective of time, I think that, at that time, the classic scheme of negotiation still weighed heavily among us or, at least, on me. From there I also must do self-criticism. This scheme has made us understand and detain the process in very closed and mechanical terms. Instead of understanding it and developing it in dialectical and dynamic terms. For that I would say that we should understand the process in its totality. Q. Therefore, you have to attack the question of sovereignty. To begin the path of sovereignty, apart from being possible, it’s indispensable. Why? Because it can be the most effective way and, certainly, the only way to force political solutions in the area of consequences as in the political. Therefore, the main point of our general strategy must be the independence process and inscribe there the consequences of the conflict. And overcome through unilateral decisions the elements of the agenda which can only be overcome unilaterally, to strengthen the independence process. We must put there the task of the prisoners. That is, taking the steps that we take in favour of an independence project and its development, to give a solution to this problem, gradual, but general and total. Q. Do you imagine an independent Basque Country in a relatively short time? We still don’t have proposals on the table – what kind of state? What social model? Nor a specific roadmap. In what steps? What subject, for the Basque Country to become a state? Therefore, this country doesn’t have the necessary instruments to undertake this process. This path can only be done with a wide and open debate, town by town, without taboos or prejudices. A constructive and attractive project has to be created, that give hope and passion. The path won’t be easy, but, doing this, we’ll realise that independence is more attainable than what we thought. Q. For some, territoriality and independence are opposing or impossible options, alleging that the rhythm of every province or sphere must be respected. Are they incompatible? These debates generate mistrust and fear in some sectors and that, in a great way, can be understandable. I, however, contemplate them with great joy. Why? Because it indicates that, finally, we’ve come out of the terrain of the demand of our own state and we’ve begun to place it in that of its materialization. Q. Must the capacity of decision be respected in the three spheres? debate, among other things, is what are the most effective means for reaching the final goal, considering the distinct correlation of forces that there are in each legal-political reality. And, I repeat, with this debate being so important, and the decisions that must be taken so profound, it can’t be done by the apparatus of the parties. Rather, these decisions must be taken among thousands of independentists, through a participative process that must be done throughout the Basque Country. On the contrary, we will get it wrong. Q. What would you prioritize politically: the independence of one part or obtaining the territoriality of the Southern Basque Country or all of the Basque Country? The priority and the only important thing is establishing the most effective measure to reach these objectives. Q. Navarre can be facing a distinct political situation, since it seems that the regional political regime is tumbling. Are you optimistic? It’s evident that the regime built in the transition is going through a serious crisis and that ever wider sectors are in favour of change. In this sense, I’m optimistic, but also prudent, because we can’t forget that Navarre is a problem of the state and, therefore, they will do everything possible to save the regime. Q. Do you see an alternative government possible in Navarre without the PSN, that is, a progressive government that unites EH Bildu, Geroa Bai, Podemos and Izquierda-Ezkerra? Ms. Barcina is not only the candidate of the UPN, she also is of the regime. And, therefore, knows that, apart from the support of the UPN, she has that of the PP and the PSOE. So that an alternative without the PSN, apart from being possible, is indispensable. Things being so, if the block for change obtains an absolute majority, I’m sure that, even then, the state, to impede change, will move the piece of the PSN to make a small change and form an alternative government to the UPN. Mind you, with various conditions: excluding EH Bildu and denying those from Navarre their voice and decision. Therefore, careful with identifying change only with the expulsion of the UPN, because when we speak of change, we speak of an initiative with a greater profundity, at least for pro-independence leftists. Q. What task should the Abertzale Left carry out on this path? In Navarre, we must act with historic responsibility and total generosity and, therefore, be conscious of the importance of Navarre in our national strategy. For this I repeat that the Abertzale left leave its small us and direct itself to a large us. Putting the interests of the people of Navarre and of all Basque citizens above our small interests and debating and deciding in Navarre the lines and proposals that Navarre must follow. Q. In an interview, you declared that, in Europe today, the task of the revolutionaries is to defend social-democracy. How do you see the situation? and the beginning of a new one. And it’s important to remember that they used to end in large wars. Q. What is special about the current crisis? In comparison with those before, it has a specificity: also announcing the exhaustion of capitalism, be it for the exhaustion of diverse prime materials, be it for climate change or for the supposed nuclear confrontation. Therefore, the very survival of the human species is in danger all over the world. I don’t want to be apocalyptic, but many of the conflicts that occur in the world – that of the Ukraine, for example – or the decision of Japan to rearm don’t presage any pleasant future. So it deals with an economic and political-military reorganization at a planetary level. Q. Where are we going, then? The crisis doesn’t have an economic solution, but a political one. Now, to increase the rate of benefits, the financial and industrial oligarchy have begun to dismantle the welfare state, squandering public money to bring it into private hands and despoiling and over exploiting prime minerals. This is their model to get out of the crisis. In this context, one has to understand that many social and economic measures that social democracy has defended – their Nordic models – are currently revolutionary – the defence of the public sector, the social policies… – among other reasons, because they are contrary to the oligarchy. Therefore, to those who take us for radicals, I would say that they go over, for example, the historic programme, from the decade of the 80’s, of the Swedish Social Democratic Party, and that they realise what we are talking about. We are not just about smoke and mirrors, in spite of that we are clear that the programmes of the – true – social democracy – can’t be our final destiny, but yes towards a socialism based on equality and justice. Q. Sortu considers itself socialist and revolutionary. What is it to be socialist in Europe in 2014? Resuming, I would say the following: committing to the conditions for the happiness of all human beings, whether they be economic, social or cultural. Taking as a unique value what Protagoras said: “the human being – although he said the man – is the measure of all things”. So, you have to develop an economy that satisfies the needs of all human beings and not the desire of accumulation of a very small minority, as capitalism does. To be a socialist is to be against wars and in favour of peace, of the freedom of the people and against imperialism. And, above all that, to be conscious of the following ethical and moral principle: to feel every injustice in the world as if it was against ourselves, because all men and women form a universal family. Q. And, from the point of view of the Basque Country? When they ask about socialism – the question makes me very happy – it’s very common to hear that our economic alternatives, or they’re crazy or else they are notions, or they are imported from other models (Cuba, Venezuela…). This has as its objective to distort our proposals. We, on the other hand, have to say that the Basque Country must build its own model of socialism, that takes into account cultural, sociological and socio-economic characteristics of Basque society and based on them. In the second place, I will say that, in our judgement, the overcoming of capitalism, more than indispensable, is something of life or death for the human species, but having clear that you can’t do it from one day to the other nor in just one country. This has to be done on a world wide scale, and with the consensus of society: there is no other way. Q. Are political and economic sovereignties related? example, in these cases, at the service of all of society; guaranteeing the public and universal provision of education and healthcare, reinforcing its popular and democratic control, promoting and respecting the parity between men and women… After all, building the material and cultural bases to guarantee happiness for all human beings. Q. Are you optimistic about the situation of the left in the world? There are reasons to be so, but there are also reasons for worry. If we pay attention to the historical phase cited above, some time ago I sustained the necessity of that the left builds – taking the time necessary – a new international, a a global scale. I repeat, with the survival of our species in danger, we have to set out a global strategy, among other spheres, in favour of peace and nuclear disarmament: to promote a dynamic against climate change and to give a global alternative to neoliberalism. How? Regarding this universal conscience mentioned above, we have to plant a radical reorganization of the United Nations and to build alternative instruments for some kind of world government, with ethical and moral references from around the world. For example, although they are dead, Mandela, Rosa Parks, or among the living, Pepe Mujica, Al Gore, Malala Yousafzai, Desmond Tutu, Perez Esquivel and some other Nobel Peace Prize winners… politicians who have always had the capacity to leave the perspective or their party to put all of the interests of society in front, – Fidel Castro, or it could also be Ibarretxe – or people from cinema like Oliver Stone… – . Therefore, resuming this reorganization of the United Nations, there must be organized a world council that promotes this necessary universal conscious. We must give form to these kinds of proposals and it would be beautiful that the first tasks for that came from the Basque Country, because we would newly demonstrate that the small is large in its smallness. Q. In Spain, the creation of Podemos has generated a great controversy. Do you see a future in this movement? What do you think of the work that they can do? Since they use against them anything that I could say about Podemos, I’ll be very careful in my response: it seems that they are bringing us a breath of fresh air.